Endodontics is the dental specialty concerned with treatment of dental pulp and/or apex periodontium. 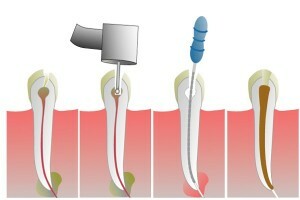 The treatment includes a series of actions beginning with an approach to the oral cavity, followed by finding all the root canals, root canal treatment (instrumentation), irrigation (lavage), obturation (filling) of the dental canal system with adequate materials with the main goal of achieving the airtight and threedimensional closing of the tooth canal system which gives back the biological function to the tooth itself and makes the recovery possible. Afterwards follows the final filling of the tooth.